Ivanhoe Cambridge announced this week that it’s revamping a Quebec City shopping centre and has made its first direct investment in Australia with the partial acquisition of an office property in Sydney. Quebec City’s Laurier Québec shopping centre is getting an $18-million facelift that will modernize its food court and introduce eight new retailers to its mix. “We are proud to launch this project starting with a significant investment that will strengthen Laurier Québec’s positioning as a Quebec City retail leader,” Stéphan Landry, general manager of the Ivanhoé Cambridge-owned Laurier Québec, said in a statement. Relocating certain services will open up 5,000 square feet of floor space and increase seating capacity from 1,300 to 1,434. Washrooms will be expanded and renovated and an escalator linking the food court to the mall’s second level will be added. Work on the food court will start this summer. 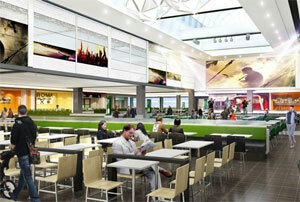 The new layout has also been designed to provide an event zone, the first of its kind for a shopping centre in Quebec. The addition of state-of-the-art multimedia and stage equipment will offer customers a continuous interactive experience while a removable stage will allow for autograph sessions, performances and other events. Laurier Québec will welcome eight new retailers by the end of 2015, including the largest Forever 21 store in the Quebec City area, which will open in the fall. The Allô Mon Coco restaurant, Centre du Rasoir, GNC, Structube, Studio, Think Kitchen and the first Faceshop in the Quebec City market are the other new arrivals. Renaud-Bray will expand while L’Imaginaire, Rogers, Vidéotron, Presse Gateway, Reitmans, San Francisco, Aqua and La Vie en Rose will carry out renovations. The project is scheduled to be completed at the end of 2016. Ivanhoé Cambridge also owns Place Ste-Foy and, along with Laurier Québec, the two properties offer a combined 1.84 million square feet of commercial area and close to 400 retail outlets. Ivanhoé Cambridge has also acquired a 25 per cent interest in Liberty Place, a core office property in Sydney, Australia, along with Blackstone Property Partners Asia. The building was purchased from Lasalle Investment Management for $228.8 million. The 42-storey Liberty Place was completed in 2013 and is 97 per cent leased. It’s located in the heart of Sydney’s Midtown and features 647,729 square feet of office space and 47,630 square feet of retail area. “Blackstone’s strong knowledge of the Australian market and its established presence in Australia have been key to the success of this transaction,” Ivanhoé Cambridge executive vice-president for growth markets Rita-Rose Gagné said in a release. Ivanhoé Cambridge is a real estate subsidiary of the Caisse de dépôt et placement du Québec, one of Canada’s leading institutional fund managers. Through multiple subsidiaries and partnerships, it has assets in Canada, the United States, Europe, Brazil, Mexico and Asia that were valued at more than $42 billion at the end of 2014.